Do you know that feeling – you see a yarn and immediately fall in love? Nowadays I try to be sensible and only buy yarn with a specific project in mind. But it still happens to me every now and then that I see a yarn that is so beautiful I just have to take it home with me, even though I have no idea what I’m going to do with it. 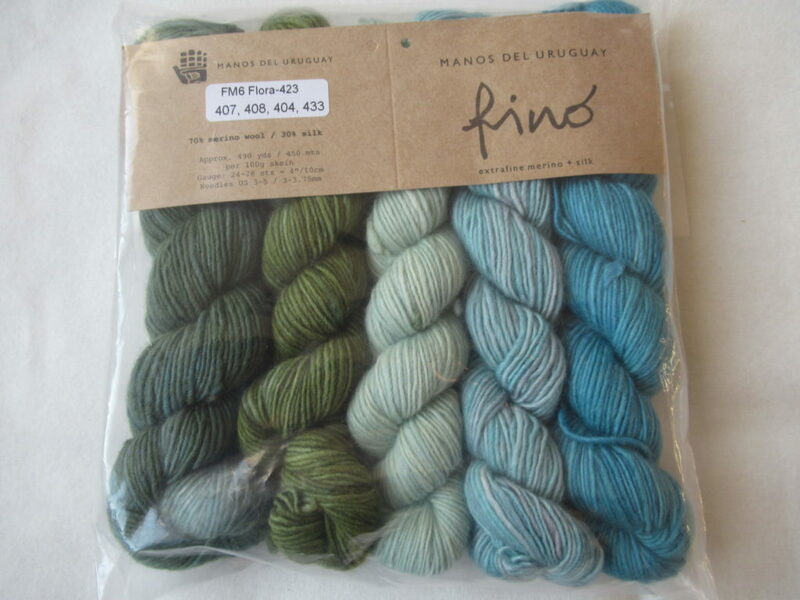 ‘Fino’ from Manos del Uruguay is one of those yarns. The tiny ball in the yarn bowl in an earlier post already gave you a glimpse of it. Before I start describing the yarn, I need to tell you that these mini-skeins are exactly the same yarn as the full skeins of Manos ‘Fino’. 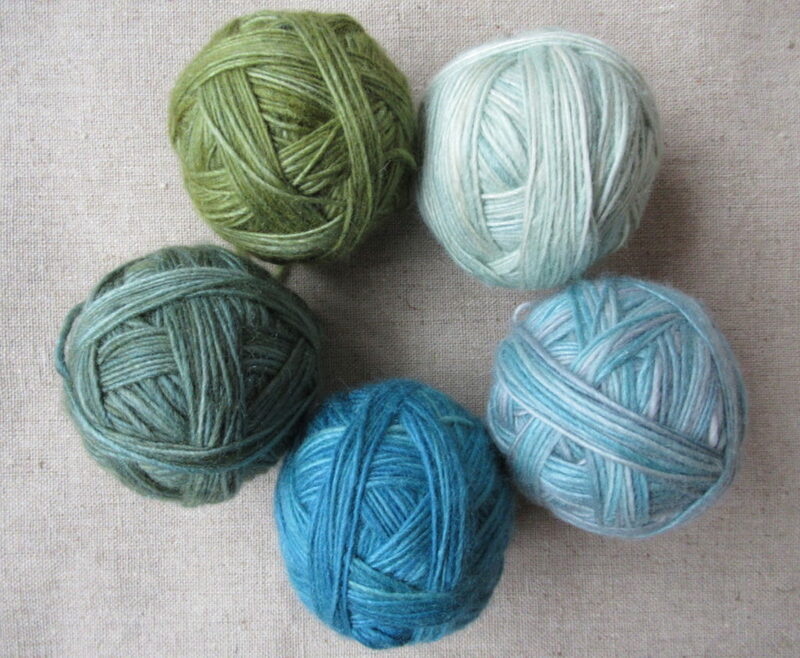 A set of five 20 gram mini-skeins has the same yardage and the same weight as one 100 gram skein. 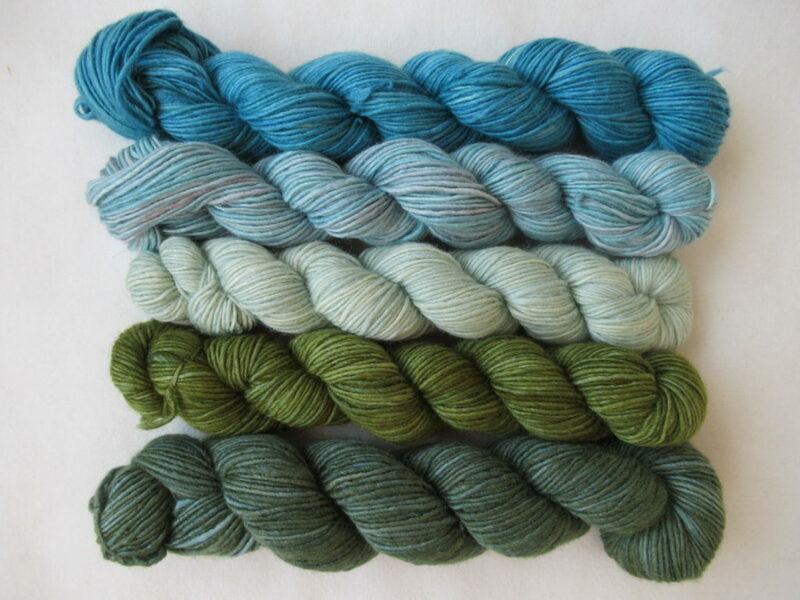 And all of the colours in the mini-skein sets are also available as full skeins. From top to bottom the colours are: 433 Folly, 404 Watered Silk, 408 Crystal Goblet, 407 Velvet Pincushion and 423 Tincture. Folly, Watered Silk, Crystal Goblet… it looks like they’ve found their colour inspiration at some 18th or 19th century mansion, doesn’t it? … you can see that there is pale turquoise and even paler turquoise in it, but also some purplish grey, steel blue and mauve. All in all, this gives a lively (but not too busy) effect. 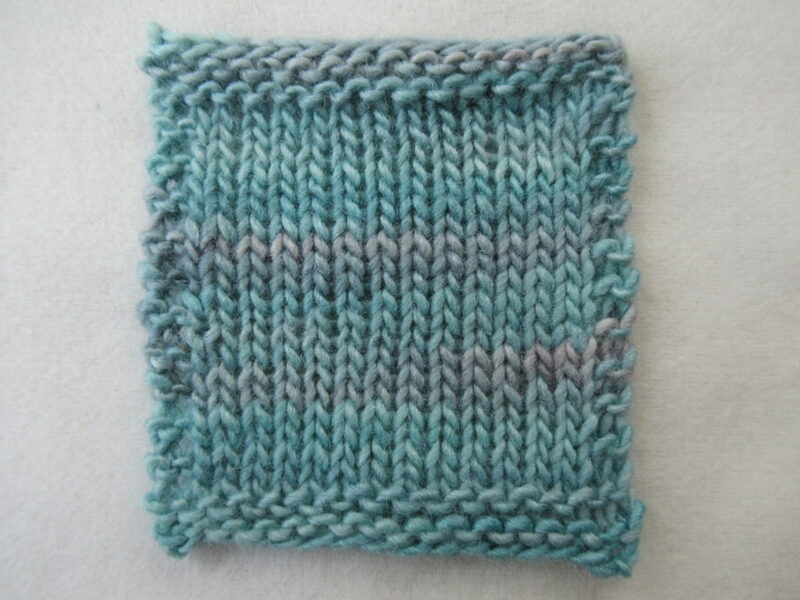 The yarn is not entirely even – it has slightly thicker and thinner bits. I think this adds to its charm on the whole. There were one or two blobs of silk in my yarn that were too thick to my taste, but I was able to remove them very carefully without damaging the thread. I always like to know where a yarn I’m using comes from. What the story behind it is. So I did some research and discovered that Manos yarns have a very interesting story to tell. What I found out is that Manos del Uruguay (Hands of Uruguay) is a not-for-profit organization, comprising 12 individual cooperatives, owned by the women who work there. The cooperatives are all located in rural areas of the country and their products are certified by the World Fair Trade Organization. There’s much more to tell, but the artisans can tell their own story much better than I ever could. In honour of their fiftieth anniversary they’ve made a 6-minute video that gives a great impression of their work. Don’t you just love those long, long lines with skeins of dyed yarn, drying on the air outside? I have a little more experience knitting with this yarn than just these small swatches, as I’m also working on another project in Fino, an easy-to-knit accessory that I hope to tell you more about later this spring. I first used the blues and greens shown here, and I’m making another version in a totally different (but equally beautiful) colourway now. 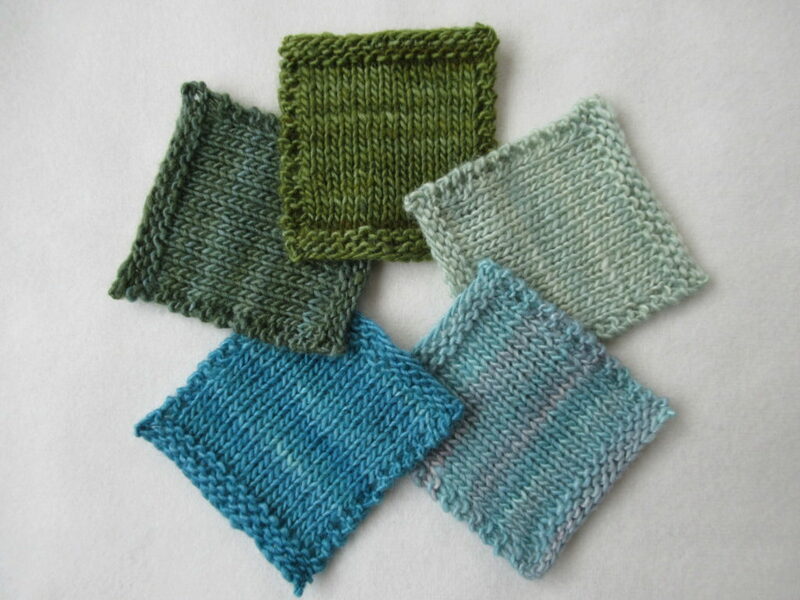 The yarn knits up to a fairly even fabric. Very fine, or more open and drapey depending on the needle size used. The yarn is so beautiful that just plain stocking stitch would be a good choice, but I think it will work equally well in a cable or lace pattern. Because it is so soft, it is perfect for accessories worn close to the skin, like shawls, cowls or hats. I don’t think it will stand up to frequent (machine) washing, so I wouldn’t recommend it for baby knits. 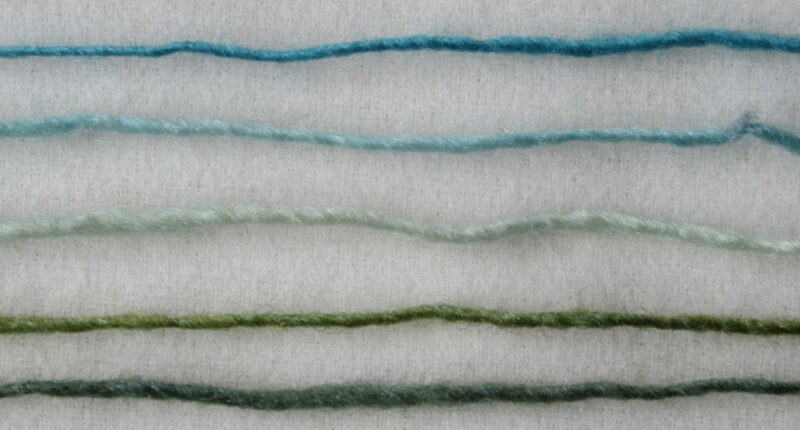 Some bleeding is common in hand-dyed yarns. But when I soaked the items I knit in a non-rinse wool detergent these colours didn’t bleed at all. In fact, I didn’t buy this yarn in a shop, but at a big annual needle crafts fair, where I spent a wonderful day with a friend who loves knitting just as much as I do. The yarn seller does have a shop – De Roopoorte, near Ghent in Belgium – but I haven’t been there, so I can’t tell you about it. What I can tell you is that Evelyne, the owner, has a good eye for beautiful yarns and interesting pattern books. And she stayed calm and friendly all day long, patiently giving people advice about yarns and patterns, no matter how big the crowds milling around her stand got. You may (or may not) have noticed that I sometimes add notes to my blog posts saying something like ‘This post is not sponsored in any way’. I feel a bit silly adding these notes. I mean, who’d want to sponsor me? The reason I’m adding these notes is that I want to make it clear that nobody is paying me to say nice things about their yarn, shop, designs, books etcetera. When I say nice things about something or somebody, it’s because I really mean them. This also applies to this post. Honesty and integrity are important values to me. So even though it feels rather silly, I’ll keep adding these notes from time to time. I’ve had such fun playing with this yarn – winding the small skeins into balls, knitting those tiny swatches, taking lots of photos. I hope it’s been fun to look at and read, too. Thank you for spending some time here. Wat een prachtige proeflapjes, de zachtheid straalt ervan af. Heel mooi en ik ben benieuwd wat het gaat worden.